When a person takes great pains NOT to be famous, that's when you know something good is going on. When a person takes great pains NOT to be famous, that's when you know something good is going on. Suzanne Belperron was such a person. Born in 1900 in Saint-Claude in the Jura region of France -- an hour's drive from Geneva --and educated at the School of Fine Arts in Besancon, she made some of the most inventive, exquisite jewelry of the 20th century. 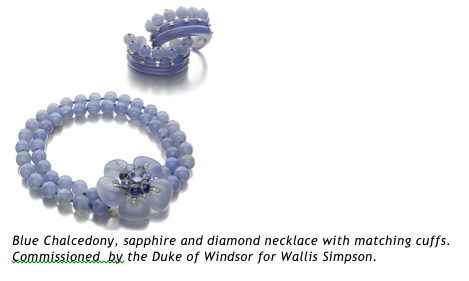 My friends, if you have nothing to do on May 14, 2012 at 10:00 a.m., PLEASE take yourself to Sotheby's in Geneva where the PERSONAL jewelry collection of Mme. Belperron is being auctioned. Fifty lots will be presented for sale -- the most significant group ever to appear on the market (then you can drive to her hometown and sample the best comte there is). Meanwhile, after working at the venerable house of Boivin in Paris, Suzanne Belperron began a collaboration with the pearl dealer Bernard Herz. Mr. Herz gave her free reign, and so began the most productive years in her career. Their firm became Herz-Belperron. Tragically, in WWII, Bernard Herz was taken to a concentration camp where he was killed. To save the partnership from being hijacked by the Gestapo, she took full control of the company -- the firm was now Suzanne Belperron. Boss? Woman?? WWII? France? Impressive. For her efforts in the Resistance, she was granted the rank of the Knight of the Legion of Honor. Mme. 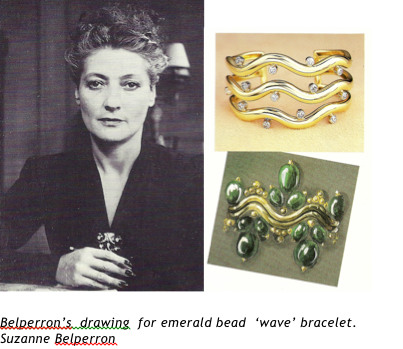 Belperron, well known amongst her friends and colleagues for being discreet, declined to sign her pieces believing they needed no introduction as, in her words, "my style is my signature." How is that for discretion? Say Less, Do More -- n'est ce-pas?